These earrings are sure to put an everlasting smile on her face. They are simple yet elegant and can be worn every day. Boasting 2.44cts total weight of round brilliant cut diamonds, F color, SI clarity. They are beautiful and bright stones, elegantly set in handmade platinum 4 prong martini settings. Our pieces are all accompanied by an appraisal performed by one of our in-house GIA Graduates. They are also accompanied by GIA grading report(s), AGL grading report(s), original certificate(s) and other documents, if specified in the listing. We guarantee all products we sell and our number one priority is your complete 100% satisfaction. 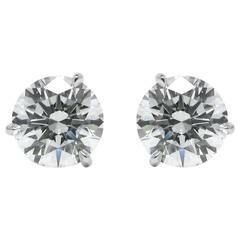 Gorgeous 4.05 carat GIA certified "Excellent Cut Grade" round brilliant diamond stud earrings.